These charms are made from an exquisite metal. They are perfect accessories for your dog collars and can also be used to accessorize keychains. 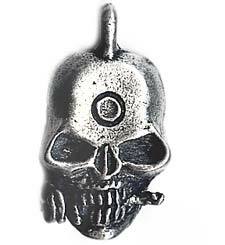 This charm depicts a Mean looking skull. Approximately 3/4 in. x 1 in. not including the removable keyring.